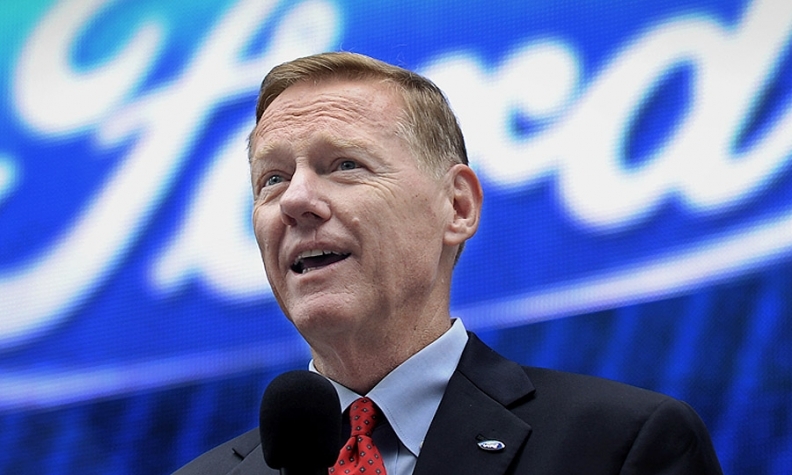 Mulally: "I will continue serving Ford." BERLIN (Bloomberg) -- Ford Motor Co. CEO Alan Mulally reiterated that he intends to lead the automaker through next year, following reports that Microsoft Corp. may seek to recruit him. "I plan to continue to serve as Ford's president and CEO until at least the end of 2014," to remain "absolutely laser focused" on earnings growth, Mulally wrote in an e-mail to Bloomberg News today. "I love serving Ford and will continue serving Ford," Mulally said in an interview from Berlin on Bloomberg Television's "Countdown." Mulally, 68, has been talked about as a possible interim CEO at Microsoft, AllThingsD reported Sept. 2. Microsoft CEO Steve Ballmer, 57, said on Aug. 23 that he plans to step down in the next 12 months, kicking off a debate about his possible successor. Under a succession plan outlined late last year, Mulally, 68, was expected to stay on as CEO until at least the end of 2014. Reuters reported yesterday that he may step down sooner than planned, citing two people with knowledge of the matter. The news service said Ford's board is open to letting him step down earlier as he explores other roles. Mulally is considering another high-profile job to follow up his tenure at Ford, those sources said, adding that he had discussed a role in the Obama administration at one point. Mulally, who previously ran Boeing Co.'s commercial- aircraft unit, joined Ford in September 2006 and led the automaker through the global credit crunch following the Lehman Brothers Holdings Inc. collapse without tapping government money. He's in Berlin at the IFA technology show to present the S-Max SUV prototype that features new connectivity technologies including voice-control smartphone applications and a heart-rate monitoring seat. Ford has a partnership with Microsoft to develop the car manufacturer's Sync system that integrates the mobile devices into the car and connects the vehicle to the Internet.